The Used Equipment Area (UE Area) will open at 10am on Saturday. There will be no sales or previewing of items before we open! 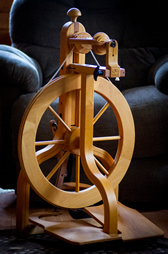 Are you looking for a used loom, spinning wheel, hand carders or resource books? Head for the Used Equipment Area! Sales in this area are only done by cash or personal checks. Sorry, no credit cards. Due to having multiple vendors in this area, please have small denomination bills to ease payment process. Need to make some room in your workshop or barn? Troubled by what to do with the no longer needed shearing stand or clippers? Have one too many spinning wheels? Bring them to the Fiber Frolic Used Equipment Area! Examples of items you might consider selling: feeders, scales panels, shears, carders, spinning wheels, swifts, looms, niddy-noddies, knitting needles, and pattern books. Any fiber animal related equipment you no longer use. All equipment must be clean and in working order. Please attach any operating instructions or accessories. Items for sale are left with volunteers running the UE Area. Any sale that occurs during the day will be executed for you and recorded. PLEASE pre-register. Download the form (used equipment form pdf file; or used equipment form msword file), complete and mail to the address printed on the form. Tag all items with YOUR NAME, ITEM #, DESCRIPTION, and PRICE. Items can be delivered and checked-in Friday from 12-6 PM or Saturday and Sunday before 10AM. Walk-ins the day of the fair are welcome before 10:00 AM (you don't have to preregister). You'll just need to spend some time on the paper work if you wait until Saturday. When you arrive at the Frolic, bring your items directly to the UE Area. Items will be accepted NO LATER than 10 AM each day. Car delivery of large items must be made before 8:30 AM and vehicles removed from the area. Your item will be logged in by a volunteer. Please make sure all items are tagged correctly. Any unsold items can remain in the UE Area Saturday night. All unsold items MUST be removed from the UE Area NO LATER than 4:30 PM Sunday. After 3 PM You can pick up proceeds, pay commission and/or pick up unsold items. The Maine Fiber Frolic assesses a 10% commission of the sale price of each item sold at the Fiber Frolic that goes toward MFF expenses. Volunteers are not paid. All items are left at the UE Area at the owner's risk. The Maine Fiber Frolic staff will take every precaution in displaying and handling your equipment, but MFF is not responsible for any damage or theft. Special Note: Ginny Williams will forever be THE Chairperson of the Maine Fiber Frolic Used Equipment Area. Those of us that work this year will be missing her terribly. She was our dear friend, as well as, our inspiration.